The Volkswagen Golf R is a genuine performance car built on an economy car platform. What do you need to know before you buy a Golf R? Don’t worry, we’ll tell you everything right here in the Ultimate Buyer’s Guide. Wow, 35 grand for a hatchback! “Crazy,” they say. But it’s really not all that crazy when you consider that, in the Golf R, you’re getting a car that can do almost anything. Conquer snow? No problem. Leave V8 Mustangs in the dust? Bring it on. Fit your mountain bike and snowboard in the back? Chuck it on in. Get good fuel economy? Yep, you can skip that gas station. 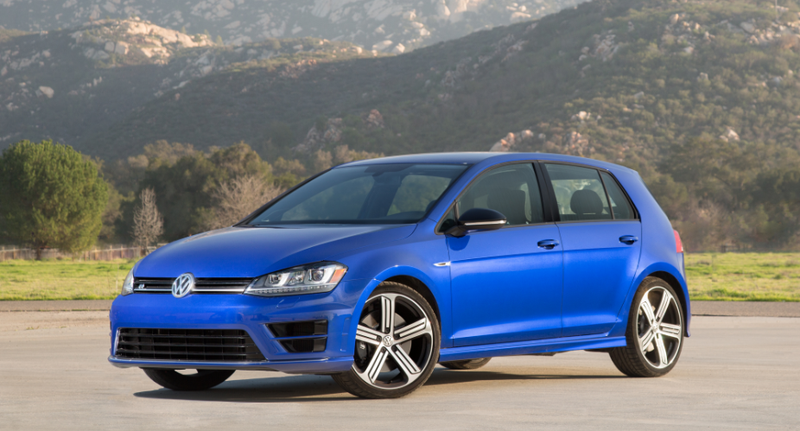 Sure, it may not look like a sports car, but the Golf R is a performance car without the compromises. And we really mean it when we say “performance car.” The Golf R, like the Audi S3 upon which it is heavily based, gets a 292 horsepower turbo four that propels the 3,300 pound hatch to sixty in under five seconds. You can thank Volkswagen’s dual clutch transmission and all-wheel drive system—standard on the R— for getting that power down. That all-wheel drive system is totally befitting of a true performance car. The “4Motion” system uses an electro-hydraulic oil pump to apportion torque between the front and rear wheels via a clutch pack. This system can send as much as 50 percent of the engine’s torque to the rear axle, and works so quickly that the front wheels never get a chance to lose traction. There are also electronic differential locks (EDS), which apply brakes to the wheel with the least traction, thereby sending torque to the wheel that can better put the power down. The trick all-wheel drive system, coupled with the R’s torque engine, quick-shifting transmission, lightweight body, and great suspension tuning makes this little economy car worthy competition for any sports car in its price range. We took the Golf R out to Lime Rock with a bunch of other performance cars, including a Porsche Cayman GTS and a Ford Mustang, and it more than held its own. While it isn’t Cayman-quick, the Golf R is remarkably balanced and easy to drive fast. No one was sad about having to swap back into the Golf R from the Alfa 4C. Quite the opposite. There was no car easier and more comfortable to turn lap times in at first than the Golf R. Just ask Mike. While some hot hatches are about smoking the front tires around every turn, the AWD Golf R is more about turning quick lap times. With abundant power in a relatively lightweight package you can point it out of a turn, squeeze the trigger, and it’ll rocket itself int the direction of the next one with surprising poise and limited roll. Despite its prowess on the track, the Golf R is a lot like the GTI in that it’s actually quite comfortable around town. Sure, it’s a little stiff, but you won’t have to explain to your date why they can’t drink coffee in you new car. As with the GTI, this is one car where we won’t blame you for getting an automatic. Volkswagen reintroduced the Golf R in 2015 after a two year hiatus. The new R brought nearly 40 more horsepower, four more MPG on the highway, more interior room, and less weight than the 2013 model it replaced. This year, the 2016 adds an updated MIB II infotainment system, and, more importantly, a six-speed manual transmission. It may not be as fast as the auto, but few things say “Fahrvergnügen” like a clutch and a shifter. The new Golf R is the most powerful Volkswagen Golf ever, churning out 292 ponies and 280 lb-ft of torque at only 1,800 rpm. That power makes it to the ground via a six-speed dual clutch transmission called a DSG or a six-speed conventional manual transmission. The DSG with this engine is a potent pairing, giving this 3,300 pound hatch acceleration figures unheard of on a compact hatchback. Fuel economy is decent for a car this quick. You’ll muster over 30 MPG on the highway, while your city numbers will be only okay – maybe a bit on the low side. The auto actually out-scores the manual in combined fuel economy, whereas the manual does 1 MPG better on the highway. Either way, you’ve got a car that can blow the doors off of cars with three times the displacement, and still manage 30 MPG highway. That’s just awesome. The Golf R comes in only two variants: Golf R and Golf R with DCC And Navigation. Golf R: Base model. Starts at $35,650. Notable standard features: 2.0-liter turbo I4, all-wheel drive with Haldex center differential, six-speed manual transmission, 18-inch aluminum wheels, performance summer tires, Bluetooth, rearview camera, keyless entry, push button start, automatic headlights, rain-sensing wipers, MIB II infotainment system, 6.5-inch display, satellite radio, leather-wrapped steering wheel, dual zone automatic climate control, leather seats, drive mode selection feature. Notable options: automatic transmission ($1,100). Golf R With DCC And Navigation: Starts at $37,895: Notable standard features over the S: Four-mode DCC Adaptive Suspension, 19-inch aluminum wheels, MIB II infotainment system with navigation, Fender premium audio system. Notable options: automatic transmission ($1,100); Driver Assistance Package: Adaptive cruise control, forward collision warning with emergency braking, lane departure warning, blind spot monitor with rear traffic alert, park assist ($1,295). Let me also tell you this about the Golf R: pay extra for DCC. Coming back on the same roads as before, DCC in “Race” mode was a revelation. That nagging understeer was gone. The car was a noticeably more adept handler, more direct and more pointed, diving into corners with incredible precision.